Today I caught hold of an article as it bobbed past on a sea of social media. It was about a world I’d never heard of – the neuston. Whole ocean ecosystems living on the cusp of water and air, everywhere from tiny ponds to giant seas. Oceanic neuston were described as an upside-down coral reef, full of life in vibrant hues. Tiny beasts like blue sea dragons living in seaborne meadows. Impossible creatures on the cusp of alchemy, holding tight to the meniscus while choppy waters (or worse*) threaten to break up their colony. But these exquisite beings floating in the Utata pool are no nudibranchs, they’re not even sea creatures at all. 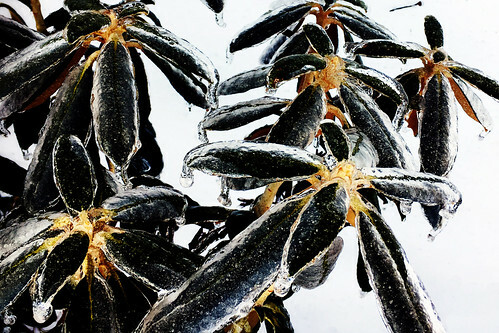 Rhododendron, encased in ice, their waxy leaves protecting them from the worst that winter can hurl their way. Living on the cusp of freeze and thaw, waiting it out until their turn to burst into foppish blooms of irrepressible colour at the first sign of spring. The divinely clever beauty of nature. * After you’ve visited Christine’s photo on Flickr and left her a comment, the article is worth a read.